I am no longer using an iPhone as my cellphone of choice. Let that sink in for a moment. I have purchased an iPhone 3G, 3GS and 4 on launch days, lining up several hours before the store opened and I give up the Apple device so close to the release of the iPhone 5? How did this happen? For the last few months Gord has been touting the joys of cheap ( ) and reliable phone service from Wind. 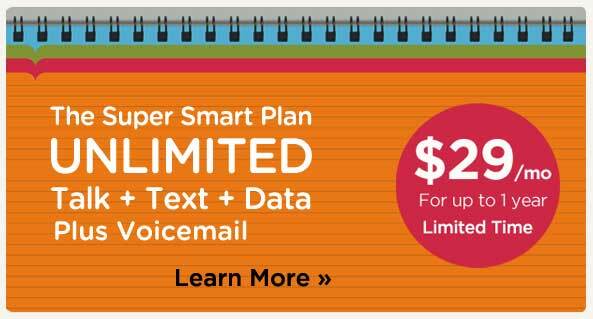 After looking at my $70+/month phone bill with great disgust I thought it was time to become contract free and save some money. Wind and Mobilicity operate on the AWS network band and this means that all available versions of the iPhone are incompatible so if I was going to make the switch I would have to (1) wait until T-Mobile became a carrier of the iPhone 5 (who operate on the AWS band) or (2) go in the opposite direction and use an Android device. T-Mobile announced they would not be receiving the iPhone 5 so if I was going to be contract free it would be without Apple. I have always been curious about Android but had no reason to switch so Hell froze over and I made the move. Mobilicity did not have coverage in Sherwood Park so I was limited to look at Wind phones. There are new Android devices released every month but Wind only had a few available to purchase, and even fewer were in stock. I went to five different Wind locations (two at Blockbuster and three kiosks) before finding one that had the LG Optimus 2X in stock. I tried to phone in advance but no one answered the listed numbers so I had to drive to each and ask about their inventory levels. Gord gave me some assistance from Calgary as to which stores had the LG in stock but I was still turned down at the City Center kiosk. I was willing to drive a bit to switch from Rogers but my patience was growing a little thin locating kiosks inside a mall. Thankfully Kingsway Mall would be my last stop as they had the LG in stock. The annoyance of driving around has long been forgotten and in the end it all worked out. The phone may not be one of the HTC brands I lust over but the the important thing is that I am off Rogers and am a free agent. I love iOS and find the Android OS very confusing so I am faced with a bit of a learning curve. Millions of other people figured out Android so I’m sure I will in time, it will just take some hands on experience. I sold my iPhone 4 to a co-worker and the money earned nearly paid for terminating my Rogers contract so that’s it. I’m an Android user. Maybe for a year, maybe forever. I do know I won’t go near another long term contract when there is now some much needed competition in the market. I’ll write another post on my thoughts about Wind and Android in a few weeks time. Update: The post regarding my first two weeks with Wind and Android is here. Between climbing a mountain and floating down a river last weekend Gord and I were talking about the Gallery software we use on our respective sites. He mentioned there was a new version of the software that featured some fancy upgrades. I thought the Gallery project was abandoned, but I guess development stopped on Gallery2 to make way for Gallery3. 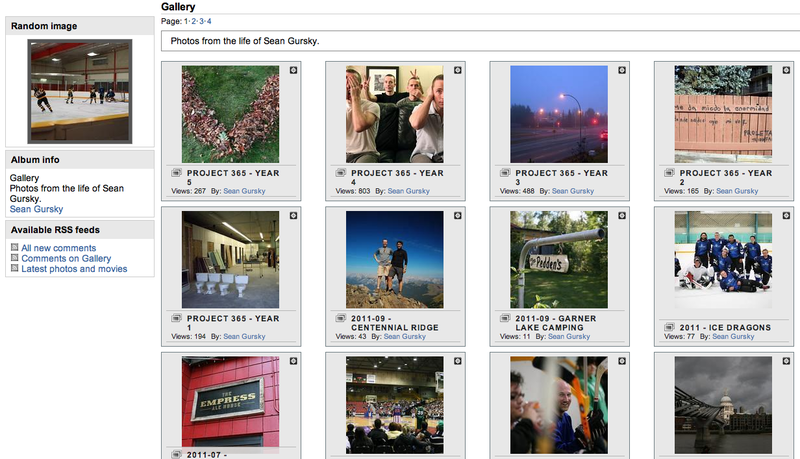 On Monday I began the process of installing Gallery3 and configuring it to my server and preferences. There were several hurdles in the installation. Some were documented but I only accidentally stumbled across them while searching for another issue. I ran the migration module and slowly my Gallery3 library was filling up with photos from Gallery2 ( ). This was a several hour job but it had over 4000 items to move so I forgave the wait and was happy that it completed without issue. I had Gallery3 running for a day and a half before deciding to downgrade back to Gallery2, and here are some reasons why. Gallery3 worked well enough but I think I had been using Gallery2 for so long that if I couldn’t get it to look just like Gallery2 I got frustrated. I spent hours installing the available themes, customizing the options and then digging into the CSS to modify items I wasn’t satisfied with. There was a developer who was working on a “Classic” theme, but their demo site produced a server error and they hadn’t posted in months. 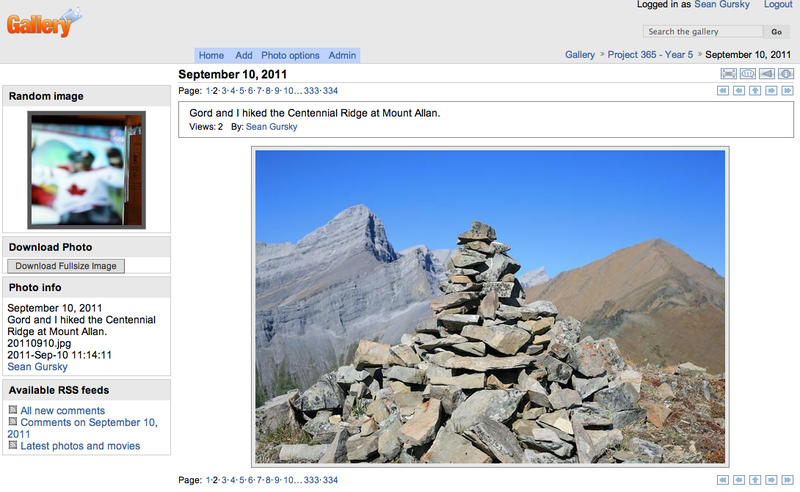 That may have been all I needed to stay with Gallery3 but visuals aren’t enough to ignore missing features. I appreciated the effort to have SEO friendly slugs but it didn’t work with my folder/file naming convention. Folders had an address of http://gallery.seangursky.com/index.php/Project-365-Year-5 and clicking on an individual file had an address of http://gallery.seangursky.com/index.php/Project-365-Year-5/20110910. This wasn’t so bad except some file names were long (look no further than something like http://gallery.seangursky.com/index.php/2011-Ice-Dragons/2011-08-12-Shredders_Castledowns_6430) and my compulsion to have things look good would have forced me to rename several thousand files so the URL’s look better. For reasons unexplained it bothered me that “index.php” was present in all of the addresses. Gallery2 has a constant “main.php” but at least the album and photo are pulled through a query string, but the combination of “index.php” and long addresses pushed me over the edge. I was able to look the other way for a few nuisances but then I found some potential deal breakers. 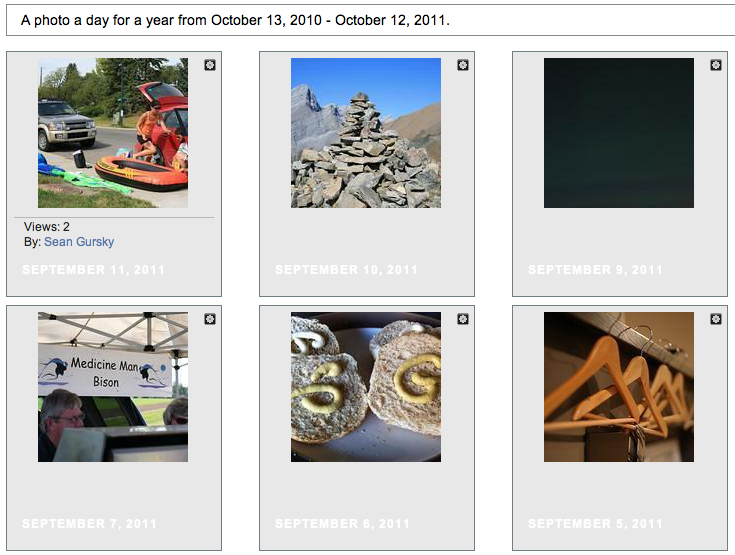 The two Gallery3 WordPress plugins I installed couldn’t recreate the current Project 365 Grid of photos I currently use ( ). 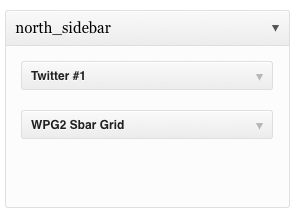 I even used the WPG3 plugin (which was the predecessor to the one I was using in WPG2) and had no success. I was able to have the plugins communicate with Gallery3 using the REST API module but I couldn’t see a way to get what I wanted without making it myself. 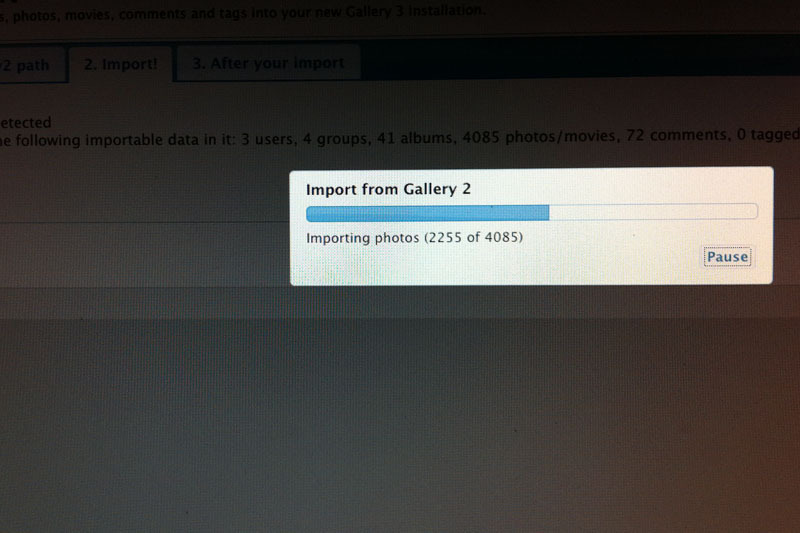 The “Summary” title on my photos was merged into the “Description” text when the Gallery2 to Gallery3 migration was performed. This made my updated descriptions look something like “Fluid Hair Vandalism An ad campaign by an Old Strathcona company got people all riled up and some reacted by vandalizing their storefront.”, where “Fluid Hair Vandalism” was the original “Summary”. I could run some PHP/SQL to look for the upper case letters and remove the offending string but that would have been tedious and probably made a few errors along the way. I had no problems with installing modules to open up functionality of themes but when I was recreating my workflow in Gallery2 there were problems starting to appear. 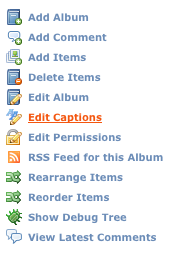 I was no longer able to “Edit Captions” for all photos within an album ( ). Instead I had to click on the “Edit” (gearbox icon) ( ) on each photo I wanted to edit, which added unnecessary clicks into my day. The gearbox was a nice feature but it slowed me down when I wanted to rename multiple items or when I would accidentaly click on it. 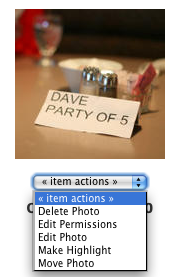 I am fine using the “Album/Item Actions” drop down ( ) and it would have been nice if there was an option to change how the “Actions” menu was accessed. 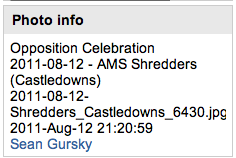 I wanted to customize the metadata information that displayed on an album. Instead of showing the number of views on the thumbnail overlay I wanted to show the item count. 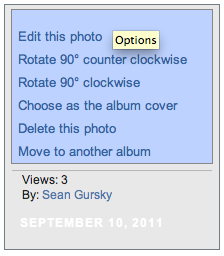 This information was visible once you clicked into the album but I find album size more important than number of views. This should be possible to change in the template but it was just one more thing I’d have to manipulate myself. I was no longer able to customize the thumbnail either, I had the “Square Thumbnails” module installed but I couldn’t focus in on a small part of the photo to generate the thumbnail. It was nice to have all of my images have a square thumbnail but I would prefer to customize the thumbnail over having uniformity in my older albums. 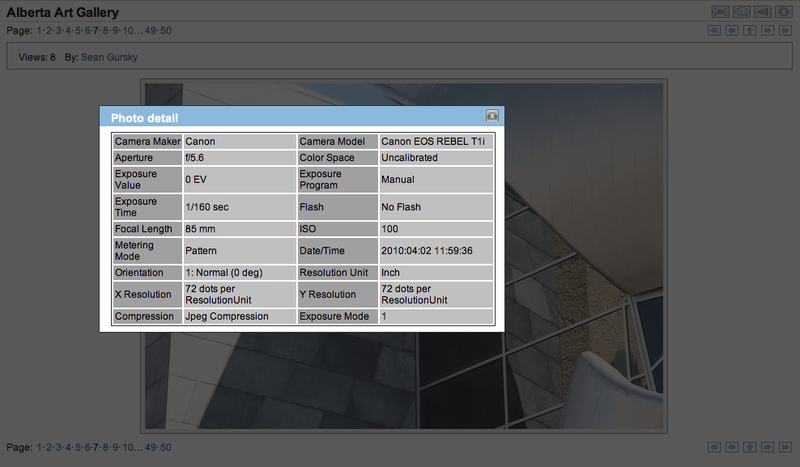 I like having my EXIF details visible for all photos but this required a click to open up a “Photo Details” modal which felt tedious and bothered me more than I thought. It was around this time I debated if I could live with these problems. 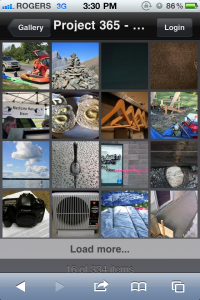 There were some incredible features of Gallery3 that I will miss, but they were more flash and not function so I decided to undo the steps I did only a day before by reverting the .htaccess file, 301 redirects and GoDaddy subdomain forwarding. Some of the pros of Gallery3 were the ease of use and installation. The administration panel was well laid out and I didn’t have to go hunting to find a setting that I needed to update. If you want to poke around the installation you can still find it here: http://seangursky.com/gallery3. I will leave the /gallery3 folder around for now so when the software has matured a bit it will make my transition a little easier. At no time did I encounter a bug or error while using the software, modules or themes. Everything seemed rock solid and was nice to use, but I couldn’t switch until all of my Gallery2 needs are met. There is active development on Gallery3, coders are always checking in updates to templates and modules but it’s just wasn’t the ideal solution for me right now.